I recently acquired an IPOD Touch. I am amazed just how many WiFi sites that are available and are free to access! In case you are not aware an Ipod Touch can pretty much do everything an iPhone can do. Except make phone calls on the cellular networks provided by the phone companies. This is how you Wifi Your Data Plan. They can connect via WiFi and browse the internet, do your email, Facebook and a thousand other applications, same as the iPhone. If you really want to make phone calls, you can use Skype to make calls. They are free when it is a computer to computer call and you pay a nominal fee when the calls are made to non Skype users. What is really neat is that all of this data, phone calls, email , net surfing , Youtube videos etc is free as long as you are using a WiFi connection. Wifi Your Data Plan and save thousands of dollars. This is the real advantage of an iPod Touch and as it turns out any smart phone that can also use WiFi. I also have an iPhone from work which does all of the things an iPhone is supposed to do over the cellular voice and data network. It is a 3G model so it is one of the later ones so it has all of the features that you need in a smart phone. I especially like the touch screen and large size that you have to work with viewing emails and web sites. It is much more intuitive to use although it does have several limitations. For example, you cannot connect other devices other than ear phones, and there is no USB interface. Even without that it is a great little tool to use and I much prefer it to a BlackBerry device. The real advantage of the iPhone in my mind is that you can program it to take advantage of free WiFi connections when there is a WiFi network around. It will use this free network instead of using the carriers data network and costing you a bundle for all of the data you are downloading. Movies take a lot of data transfer and you can use up your plan quickly, and then are forced to pay very expensive rates for all of the extra gigabits of data that you download. I do not know if other smart phones do this as well. I hope so. Maybe anyone reading this blog can let us know if this can be done by other smart phones. Most offices now have their own wifi networks. Of course they are password protected, however if you have an iPhone provided by your place of work, or you have your own, you can sign into the network and use the free WiFi instead of using up your data plan. If you do not already know this, many coffee shops offer free WiFi to entice their customers to come in and stay awhile. Starbucks had this crazy scheme were you had to have a Starbucks card and also have a balance of at least $5 on the card. If you maintain this balance you can have 2 hours of free WiFi every day, however you have to log in to your account to be authenticated. Starting in July, apparently, WiFi will be free and unlimited as well to compete with the other coffee shops in the area. So program your iPhone to take advantage of these free sites and for most sites all you need to do is log in once and the iPhone will remember this for as long as you own the phone. This is an absolutely great way to minimize your data bill with your carrier. Also you can use skype at these locations to make free calls to other Skype users. More savings for the user! McDonald’s across the US offer free WiFi. They have not copied this in Canada as of yet. Many coffee shops offer free WiFi, including Second Cup, Bridgehead, non chain shops and lots of small mom and pop shops also offer free WiFi. The major chain in Canada that currently does NOT offer free WiFi is Tim Hortons. I guess they feel that they have a large enough client base that they do not need to offer WiFi at their donuts shops. As of Sept 2012, they began rolling out WiFi to their donut shops. Add a wireless modem at home and you can use your iPhone to browse the internet and any other apps you might want to enjoy. Make sure your home WiFi is password protected, program your iPhone or iPod Touch to access this connection for surfing and playing games etc. WiFi at home also makes it much more convenient for your users with laptops or other wireless devices. 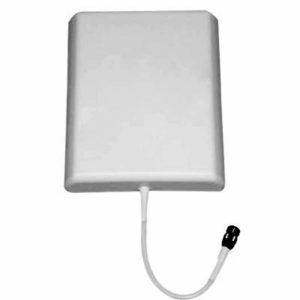 Most cable and dsl providers now offer WiFi enabled modems to enhance their customers experience and convenience. Installation is easy and from the first moment you can connect all of your computers as well as iPhones and iPod Touch devices with no problems whatever. They also come with standard Ethernet ports to allow direct wire connections for older computers or those of us who want to have a more secure connection. This is convenience at the utmost and it saves you money at the same time over your wireless data plan. If you have other thoughts about using WiFi instead of your wireless data plan on your data phone or smart phone, please feel free to leave your comments and thoughts as part of this blog. We can all use more ideas to save us money, find new applications and enable the phones we have to be better tools for us. 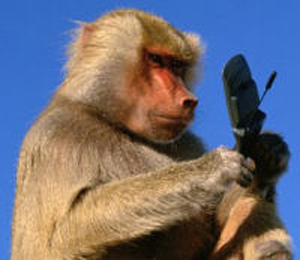 For more wireless internet details and info, click here. Many people do not have any appreciation for just how complex the telephone network is and how easily congestion can delay or prevent calls going through the network. There are many locations within the network that can act as choke points and the engineers at these communications companies are always monitoring and improving this network. However it does take time to update these networks and frankly if a given area does not have enough potential to drive revenue, the carriers will not invest a lot of money into these poor service areas. There are 5 main areas that these choke points can be lumped into. We will discuss them in a moment, however when you add data calls, the amount of traffic increases exponentially and places additional strain on the network. In fact data is growing at a higher rate than voice traffic. This is becoming a challenge to many cell phone companies since they need to spend millions of dollars to fix some of these data choke points to deal with the exponential growth in traffic. The 5 areas are: A) Airwaves B) Buildings C) Switching Gear D) Land Lines E) Application Servers. A data bit travels from your cell phone via airwaves, through building walls to cell towers, then via land lines to switching , more land lines to applications servers which will process the data bits and deliver back to you the information you requested. There are ample opportunities for the data bits to be slowed or delayed while each device deals with the traffic that is being sent to it. As traffic increases this only gets worse unless additional capacity is added. Congested airwaves are less problematic than other choke points, but they still slow service. Take the fastest 3G network today, which can support a download speed of 21 mega bits per second. Someone using a laptop wireless card that also supports 21mbps can surf the web at full speed. But if two laptop users try to download at 21mbps from the same cell tower, the highest speed each consumer will see is cut in half. If a third user tries to download at the highest speed, divide the peak speed by three, and so on. Fortunately not every laptop needs or can deal with 21 mbps, but you get the point when you have a congested site that has thousands of cell phones, or wireless cards competing for limited resources the response time can become delayed. City skyscrapers block wireless signals, and office workers using cell phones at their desks clog networks originally designed for people on the go. These same buildings can attenuate a signal so much that a cell phone can work perfectly fine outside and not at all inside. Weaker signals slow the transmission of data and use your batteries power much faster. Applications like Yahoo Messenger that constantly send and receive signals on the network play havoc with switches, which were built for sustained calls. A two-minute IM chat can require as many signals as it takes for 10 voice calls. A single computer with an air card can be running 4 or 5 applications at the same time, generating data traffic from each of the applications aimed at different servers in the network. 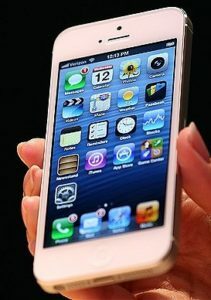 Signaling traffic is growing 50% faster than data as more apps are constantly “on,” according to Signals Research Group. That’s in part why iPhones generate more traffic than 30 basic cellphones. Data bits flow from cell towers through fiber and copper lines to a switching station and then from the switching station again via land lines to application servers via even more switching stations. Data and calls are then sent to their final destinations over even more landlines and servers. The scheme, designed pre-smartphone, can push only 75% of a tower’s maximum capacity to the next switch or endpoint. With wireless data expected to more than double annually from 2008 to 2013 as video and apps grow more popular, landlines are a growing problem. Many of the tens of thousands of applications for smartphones connect to the public Internet through their own servers. So don’t always blame the wireless carriers for bad service. Slow loading corporate e-mail or sports scores can be the fault of an app maker’s own bandwidth constraint. Whether it is ITunes, CNN or any other site that is receiving lots of traffic from all over the world, the application servers must receive the data, process it, determine what information is being asked for, find it, queue it for transmission and then send it back to the original requester. And this is the simple straight forward version. Applications servers can be their own choke point if many users are making the same request at the same time. This occurs routinely when something is advertised on a web site or on TV and thousands of people make the same request at the same time for information about the same subject. With all of these possible choke points in the network it is amazing that the communications system works as well as it does. Rest assured that data engineers are monitoring and making adjustments routinely every day to improve the network and adding capacity to deal with an ever increasing traffic demand as more and more smart phones are added by customers across the country. Most homes are not equipped with Ethernet cabling throughout the house. This is the type of cabling you need to connect your computer to your cable modem or to your DSL modem. In some cases consumers will also have a small router. They can connect to their high speed modem which will support up to four computers and a network printer. Running cables to 4 different computers and a printer spread throughout a house is a non starter for most people. They just do not want to clutter up their homes with all this cable laying along the floor. There is another solution and that is adding wireless internet to your home using a wireless router. These devices are relatively inexpensive and also easy to install. You will need to have a wireless card in each computer that you want to connect to the router over a wireless connection. If you have printers with a wireless card you can also connect the printer to the wireless network allowing all computers to print from this network printer. The printer can also be connected to one of the computers or to the router via an Ethernet card. 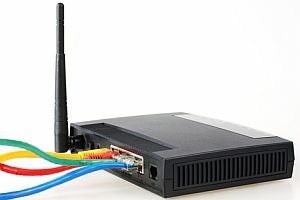 Most wireless routers will also support several wired connections as well. With a wireless router, wireless internet @ home can be very convenient. the kids can connect their computers from anywhere in the house, the parents from the den or while watching TV. Basically anywhere in the home as well as within a short distance from the home outside. Even some of your neighbors may be able to access your wireless network from their homes if your wireless router is located properly. A precaution that everyone should follow when they install wireless router is to password protect it to avoid unwanted people from accessing your network and using your service for free. The best case is that they will use your network for free and drive your traffic up to a point were your service provider decides that they need to charge you a higher fee. The worst case is that they download large files of questionable material or worse hack into your own computers and take a look around at your personal files. Right now out of four wireless networks that I can see, one is wide open and accessible. Always protect your wireless network with a password. Sometimes when I am waiting for my wife to finish an appointment at the hospital, I drive into the nearby neighborhood and look for an open WiFi that I can use to read my mail and browse the internet. I usually have no problem finding one. Password protect your WiFi to stop people like me from using your WiFi for free. Setting up wireless internet at home is pretty straight forward. Turn off your high speed modem, plug the Ethernet cable provided with your wireless router into the high speed modem and the wireless router. Plug both units in and turn on both units. Insert the CD that came with your wireless router and follow the instructions. Note you need to have a wireless modem installed in your computer and turned on for your wireless connection to work. You will be prompted to add your name, password etc and then you should be ready to connect. Provide the password to other users in your home. This is actually the network key and is needed by everyone who will access your router. Once you are connected you can move around the house or the office with your computer and always remain connected. Read your email, chat with other users and social networks, print using your wireless router, connect multiple computers, stream music or video. With all of these advantages you will wonder why you never moved to a wireless network sooner. An additional advantage is that when you have visitors or the kids come home they can easily connect to the internet via your wireless router without having to dig out a cable or unhook your own. Guests can even connect from the comfort of their room without needing a cable to connect. Routers come in various capacities in terms of being able to support multiple computers as well as maximum throughput. Before you decide on a wireless router , evaluate your needs and then decide on a router. What is the speed of your cable connection or DSL connection? Will the router utilize this maximum capacity? What content will you be downloading from the internet? Will you just be doing email and internet browsing? Or will you be downloading movies and songs which take more bandwidth? Select the router that will give you the capacity that you need. Remember that other members of the family may be using the internet for other applications so check with them before you make a decision. Select a practical location for the router that is easy to install and near where your high speed modem is located. If the router is located in the basement, there is a possibility that you will not have the best performance if you and your computer are on the top floor. Best location for a wireless router is in the middle of the house on the main floor, away from walls and other metallic obstructions. This is not always practical so try to locate your wireless router as close to the above suggestions to maximize your coverage and avoid poor performance. Conversely , if you locate the router on the 2nd floor and your office is in the basement you could also have poor connection and poor service as a result. In addition to setting up security on your wireless router, you should also set up appropriate security on your computer. This is like a 2nd line of defense. Protect your computer from viruses and hack attacks. Install a virus checking program. Close ports that are not needed. Set up your firewall on your computer as well as on your wireless router to maximize your security. For more on wireless internet discussion, click here.